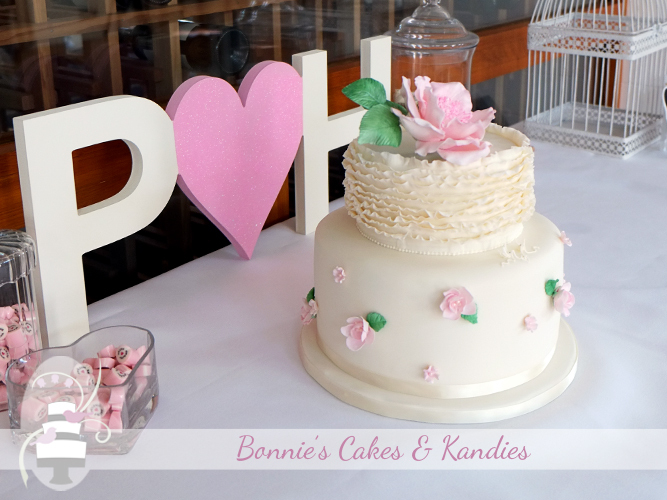 Today’s cake was custom-designed for a Rainbow Beach wedding, with the reception held at the beautiful Rainbow Beach Hotel. 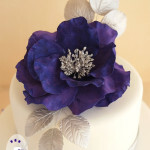 It is always a wonderful feeling when a customer tells you how much they enjoy the process of choosing their wedding cake! This cake was an absolute joy to create. In its construction, I determined a few key elements, which would incorporate my customer’s love of feminine design, ruffles, elegant statement flowers and extended height tiers mixed with single height tiers. My customer chose a combination of two of the sketches I had proposed, with the result affectionately entitled, ‘Ruffles and Roses’. 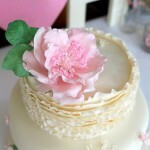 The top tier was adorned with a large, soft pink open rose statement flower, along with rows and rows of fondant ruffles. 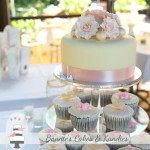 The bottom tier, made in a larger height than standard, featured a collection of dainty, soft pink roses and pearl-centred primulas attached to the side of the cake. 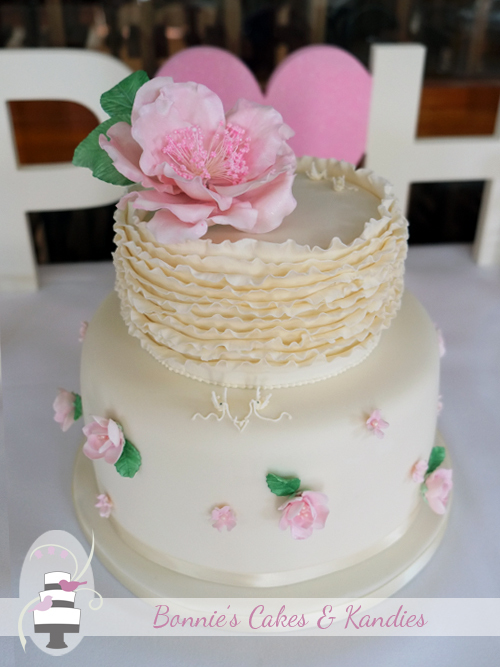 With these little roses placed around the entire bottom tier, I used small green leaves to add a touch of colour and give movement to the design. Although better seen in person than in my photographs, the leaves helped to direct attention first around the roses and primulas, and then up to the statement flower on the top tier. 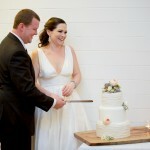 Both the cutting cake (pictured) and the kitchen cake were made free from peanuts and any peanut oils. 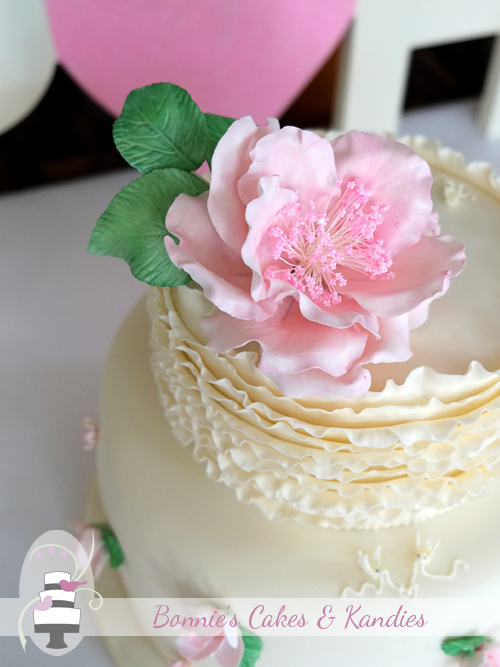 The kitchen cake was a caramel mud cake with white chocolate buttercream covering and filling, while the cutting cake was made in two different flavours. The top tier was made in traditional fruit cake, which as I’ve mentioned previously has been making a bit of a comeback of late! Dark chocolate mud cake made up the bottom tier of the cutting cake, with both tiers covered in an ivory shade of my handmade white chocolate fondant. 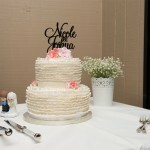 The final touch to this design was the placement of my cake signature – two little lovebirds. I usually place these somewhere out of sight, often at the back where only the happy couple might see them as they cut the cake! 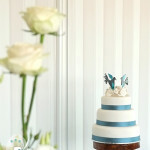 For this cake, however, when it came time to place the doves, I found that they sat just perfectly at the very front. With the statement flower being offset, I also had a little space to the right on the top of the top tier where I found that a second pair of lovebirds perched very happily to balance out the design. Many thanks to a truly delightful customer for this order; it was a great pleasure to design and create. I wish you and your husband all the joy in the world! Congratulations and very best wishes to you both!